UPDATED: Mon., April 15, 2019, 12:01 p.m. When Andy Rathbun announced he was running for mayor of Spokane, he issued a press release that attracted no press attention. “It never got picked up because nobody knows me,” said Rathbun, a retired Air Force and Air National Guard officer who has served on the West Central Community Center Board of Directors. When Shawn Poole – a decorated local firefighter and Iraq War veteran – declared he was running for mayor last year, he did get a few nibbles from local media. Still, as one might expect for a political newcomer announcing his campaign early, it mostly flew under the radar. So the two of them – along with other mayoral candidates Kelly Cruz, Chris Schroll and Jonathan Bingle – might have been more attuned than the average Spokane resident when locally famous news reader Nadine Woodward declared her candidacy for mayor April 2. 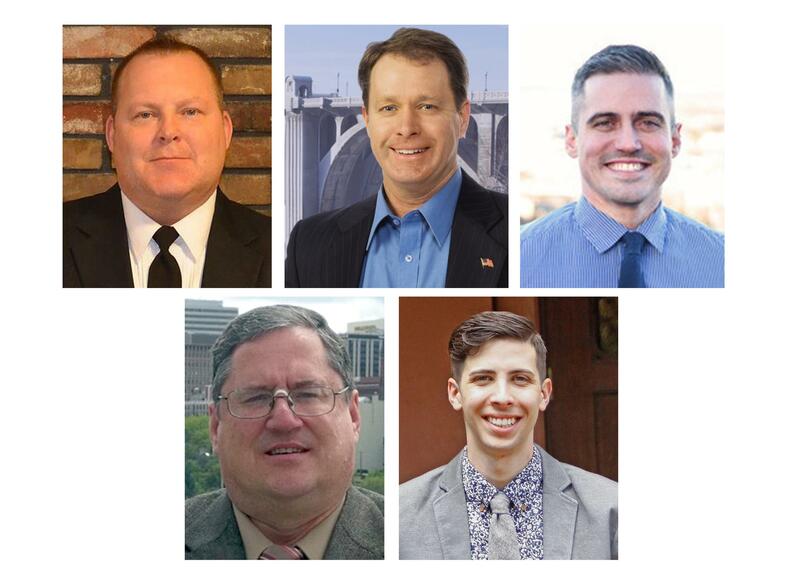 That much-expected declaration came around a year after Council President Ben Stuckart announced he would re-enter the race for mayor, after dropping out once for a short-lived congressional campaign. Woodward’s Riverfront Park news conference was covered by local news outlets as a capital-B capital-D Big Deal. A couple of prominent local pols stood smilingly behind her, including County Treasurer Michael Baumgartner and former City Councilman Steve Corker. Woodward was introduced by another locally famous TV news anchor, the retired Charles Rowe. This newspaper played the news on the front page, above the fold. It was not the first time the possibility of Woodward running for mayor had been covered as A1 news. The TV stations all covered the event with substantial stories including multiple flaccid quotations, including KXLY, the station from which Woodward recently retired, and KREM, the station where she worked beforehand. The event was long on vague, happy talk and short on anything specific. While Woodward is surely not the first candidate to lean on bromides more than proposals, news organizations usually don’t provide quite so much of a spotlight for first-day sloganeering. Which Rathbun and Poole and the other candidates have all seen firsthand. Partly in response, Rathbun and Poole decided to share a table – the Not Nadine table, they call it – at Saturday night’s Lincoln Day dinner in Spokane, the annual Republican Party shindig. It’s not surprising, or journalistically unsound, to consider how well-known a candidate is when deciding how to play the news. It’s not unusual, or journalistically unsound, to pay more attention to well-known, often-talked-about candidates than to those who are less so. Stuckart got plenty of attention for his campaign announcement as well. Having served for eight years as City Council president, started and then halted a campaign for Congress, and often been an outspoken figure while advancing policies that have sometimes been hotly debated, he is one of the best-known public officials in town. “You see Stuckart in the news five times more than you see Mayor Condon,” as Rathbun puts it. The idea that, say, Rathbun’s and Poole’s announcements would be covered in precisely the same way as Stuckart’s and Woodward’s, given their relatively different public profiles, isn’t reasonable, either. But the proportion in this case seems greatly skewed, and the asymmetrical attention lavished upon Woodward raises an important question for Spokane voters: Does working as a journalist who became locally famous make you a better candidate than serving in the military for 30 years or working as a firefighter in Spokane? And how much extra attention and consideration should a candidate get for name recognition alone? If you were swamped by the wave of Woodward – as the Not Nadines were – it feels profoundly unfair. Poole noted that by the time of Woodward’s announcement, the fact of her candidacy was already a badly kept secret. The announcement was not in any way surprising. “I knew three or four months ago that when she did decide, she was going to garner a lot of press,” he said. But the actual coverage was more than he had expected. To him, it felt like favoritism. “To view Nadine as this knight in shining armor riding in on a white horse to save the world was ill-conceived,” he said. Both men realized from the start that the there would be an uphill battle for the attention of the public. Like Woodward, Rathbun isn’t saying anything specific yet. He opposes tax cuts and thinks things could be done more efficiently in government. He comes from the conservative side, but says he isn’t doctrinaire. He says he has plans to raise his profile and to introduce more specific proposals and campaign themes. He has donated a big chunk of money – $30,000 – to his own campaign and started raising money. Both are liable to draw from the same pool of voters as Woodward. Both have entered an arena where being known by a lot of people is a valuable commodity. Both knew that going in, and knew they would face a name-recognition battle. Both knew that a well-known candidate with a lot of the local GOP machinery behind her was waiting in the wings. Both know, or should, that compiling a record of public service will get you mentioned in the newspaper a lot. Right now, when you Google their names and “Spokane mayor,” what you get is stories about Woodward and Stuckart. They’ve got to go out and make a name for themselves with voters. It is not the job of journalists to provide political newcomers with Woodward-level coverage for news conferences. My question is whether it’s the job of journalists to provide Woodward-level coverage for Woodward. Updated: April 15, 2019, 12:01 p.m.